Satisfy your cat’s carnivorous appetite with Hound & Gatos Rabbit Formula Canned Cat Food. This simple, unique pet food provides a complete meal of tantalizing human-quality animal proteins fortified with vitamins and minerals. Hound & Gatos gives cats the nutrition they need for a long, healthy life with ancestrally appropriate recipes that follow a Paleolithic diet. This means you’ll find wholesome, pure meat in every can and no added carbohydrates or plant filler. Complete and balanced premium pate style canned cat food made with rabbit wholesome ingredients. Ancestrally appropriate carnivore diet features no plant protein, 100% of the protein in this food comes from real meat. No by-products, added carbohydrates. Fillers, corn, soy, artificial flavors or preservatives. AAFCO complete diet that is suitable for adult & senior cats. All ingredients are sourced in the USA with the exception of New Zealand Lamb. Rabbit, Water, Agar-Agar, Salmon Oil, Choline Chloride, Tricalcium Phosphate, Taurine, Salt, Iron Proteinate, Zinc Proteinate, Manganese Proteinate, Copper Proteinate, Magnesium Proteinate, Sodium Selenite, Calcium Iodate, Thiamine Mononitrate, Niacin Supplement, Vitamin E Supplement, Calcium Pantotenate, Pyridoxine Hydrochloride, Riboflavin Supplement, Biotin, Vitamin A Supplement, Vitamin B12 Supplement, Vitamin D3 Supplement, Folic Acid. For Adult cats, feed 1 can per 6 - 8 lbs. of body weight per day. Kittens require up to 2 and a half times this amount. For pregnant and lactating females, allow free access to food. Adjust the amount of food you serve based on the age, size and activity level of your cat. Food should be fed at room temperature. Promptly refrigerate the unused portion. Fresh water should be available at all times. If you are currently free-feeding a kibble, the first step is to feed your cat at meal times. Put the kibble down for a 20-30 minute time frame for a few days to help your cat recognize that this is feeding time. Yes, your cat will be hungry at these mealtimes if they have been used to grazing all day long, but this step will help in the transition. Once these meal times are established, then try introducing canned food. Your cat will either like it and your transition took no time at all, or you may have to keep trying to entice the cat. If your cat will not eat the canned food you have offered, try putting some kibble on the top to entice the cat. If that doesn’t work, feed kibble and try a different protein at the next mealtime. It may take a while – a few day or a few weeks – for your cat to realize that this is food, but remember that you are doing it to better your cats health. So did I. It is a good quality food. They don't like it as much as another brand of food that had rabbit, but that brand stopped making it so I had to search for a replacement. As long as my cats keeping eating it, I will continue to buy it. 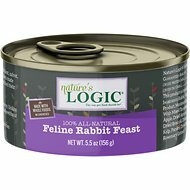 This food is a godsend because it really helped my IBD cat. I do wish it was cheaper so that more people can afford this. They have clean ingredients and nothing else out there on the market even comes close. The only thing I'm not thrilled about is the agar agar. We had switched from Instinct Ultimate Protein (rabbit) to Rawz (rabbit) because our cat that is allergic to fish protein didn't like Instinct's revamped formulation at all. Then she seemed to be reacting to something in the Rawz (maybe the fenugreek?) 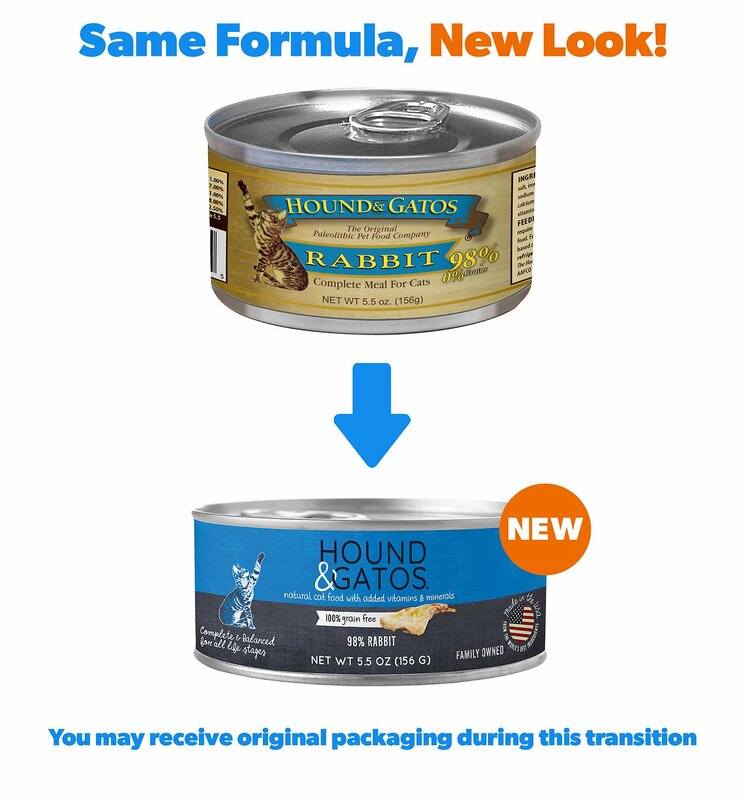 Although I'm not thrilled about giving our cats something with Agar Agar in it, we went ahead and tried Hound & Gatos. The allergic cat loves this stuff & the other one loves Rawz (with no reactions to it), so we'll be staying with these 2 brands. I used to give this as a treat to my boy who can only eat rabbit. He loved it but now the food has a horrid smell and neither he nor my other cat will touch it. Sad as this was a wonderful food. 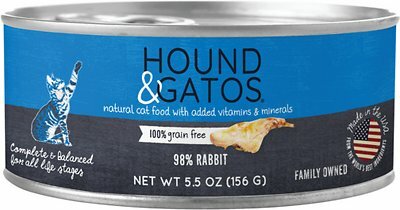 My cat loves Hound & Gatos Rabbit as it’s the only wet food that doesn’t have liver in it. She gets a Tbsp mixed with warm water every night. We love Chewy, thank you! This product is really dense so I add water. I like that since it's better value. It's part of my regular rotation and the cats enjoy it. Quality ingredients. Quality food. Kitties wouldn't touch it. This food is expensive but so are vet bills! My 15 year old cat with ibd does excellent on this food! Surprisingly, my cat loves this and it seems to have really helped his IBD. It is expensive, but if it is helping his condition, it's well worth it. My cat loves this rabbit Hound&Gatos. And I love how Hound&Gatos is such a pure cat food without all the junk other cat foods have in them.